every year as a young child, i would spend my summer vacations on the coast of Cornwall in a small fishing village, with my three older brothers and my folks. that's right dearest readers, for as long as i can remember summer vacations as a child meant a new pair of clogs. we would take a trip to the big town nearby, climb the windy narrow pavement, risking life and limb with the lorries careering past and venture into the Clog Shop. i would gaze at all the lovely pretties lined up before me, marveling at how Sweden must surely be the best place on earth to live, as everyone wore clogs upon their feet. then after a while of 'marveling', my mother and i would chose a pair and leave, clippity clopping out of the shop to spend the next year wearing our clogs with great pride. one such year, upon entering the Clog Shop i spied a pair to equal no other pair of clogs i had owned before. just the pair that called my name, telling me i was the chosen one. yes indeedy, a patchwork brown and tan pair needed my feet and my love. soon after, my family moved home thus resulting in a change of schools midyear. i dressed myself aged 10, most finely i felt, for my first morning. upon my feet, my trusty patchwork clogs. my beautiful 'pride and joy' clogs appearing to be a cause of amusement for my new classmates. i never took them out again. for we all know a good tale must have it's element of sadness, but with luck, a good tale also turns out just dandy in the end. thanks to the mighty fine vintage clog aisles on Etsy! secondhand Swedish clogs have found me. to think, they were waiting out there in the world, sensing that one day Tif would be on her thrifty, handcrafted year. that i would go searching for some 'perfectly peachy' clogs to call my own again. footynote: now would not be the time to mention that little olive also loves my clogs, that little olive and her pesky ways has taken such a liking to my clogs that alas, they are now sporting a rather sad looking wound. OH Tif, words can't express how much I love your tales. This one is up there with my favourites. 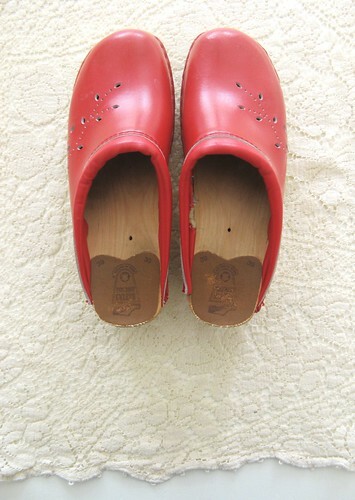 They are fine looking red clogs indeed and I am glad that they have found you. The clogs are divine, no wonder you muttered such things, I am sure I would have said much worse. Those clogs are lovely! A great find. yay for your new clogs! theY are ADORABLE! Tif, you are so very funny! And I do love your style. Those girls at your school need to hear about the hot dog factory, and I need some of those clogs! Oh Tif, I could weep with joy for you and your treasured find. I had white ones, once. Congratulations on finding such a lovely pair of clogs, Tif! oh my, that is a fun, funny story. I love the clogs, ADORE the matching "sunshine sack" and your footynote had me CRACKING UP! Gasp - they are gorgeous! Shock horror - the wound, the wound........they still look delightful on - phew. i'd like to join your challenge. Your clogs are so pretty. But, what a naughty little Miss Olive! I had brown clogs when I was about nine or ten. (I still have them, I loved them so much.) I remember in the fourth grade, wearing them to school proud as can be to clip-clop around! Sadly to say, my story is very similar to yours...and I wore them one day. You lucky girl in clogs! cute leggings by the way. Hello, what a nice story and what a nice pictures too. 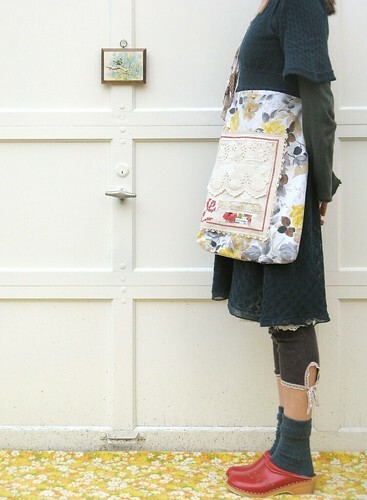 I like the outfit that you are wearing (also the lovely bag). We have a little dog too, she also took "I love you to pieces" a bit too literally sometimes. 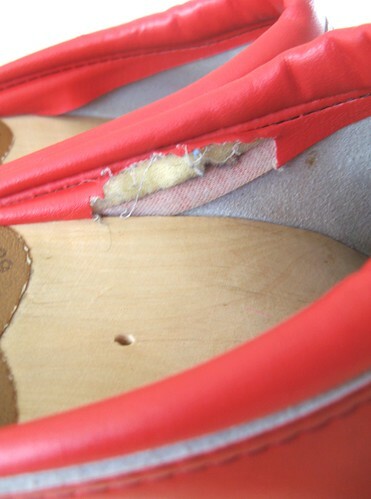 Until, one day, i had tied a thread to a lid of a not so new pan, put the lid on a small footstool where my alas damaged shoes laid, and then with the thread in my hand i waited patiently until our little muppet could not resist to hug my shoes a little too passionate. When she had approached my belongings an made a first lick i pulled the string and shouted NO!!!. Until then i did not know how high a puppy could jump: like a little lamb. Needless to mention the fact that she has NEVER approached one of our shoes so close again. I hope the lovely red clogs are not too wounded. Little Olive was Naughty Little Olive yesterday then! You can't live with 'em,and can't live without 'em (dogs that is), not the clogs or should it be the clogs! I am delighted that you found a recycled pair and hope they have lifted your spirits. They are P E R F E C T !!!! Congratulations!!! Hahaha! Great to seeyou have refound your true love. Kids can cause so much damage to each other and often unwittingly. PS one of our little "Olives" has an undie fetish. Eeuuw! But maybe that is cheaper than clogs. Maybe! oh, they're perfectly lovely, I'm very envious. They look to be in great shape, too, for second-hand. Well, apart from that little nibble mark. Lucky it's on the inside! Dear Tif, It makes my heart sing that you have found this most gorgeous and desirable pair of clogs! Just the best clog colour in the whole wide cloggy world!!! I am a new follower to your blog, and I adore this series. You inspire me! Thank you. How happy am I for you?! I used to spend holidays at Cornwall when I was a child as well, I absolutely loved them. Beautiful clogs, that's fantastic that you have fallen back in love as they are gorgeous. Really pretty bag as well. i'm so glad you've come back to clog heaven. i would not know how to live w/o my clogs. congrats on those beauties even with that new wound, i'm sure it was out of love! Ah I have a little tear in my eye for the arrival of your little red twins with their STart Rite-style leafy cut outs. I too was bedecked in fisherman's smocks and clogs as a child. At the time I did not much relish it, although I did enjoy the clippy-clop of my little red clogs. Now I see the error of my ways. oh, I do love my clogs ... live in them (a point of fact, everyone will tell you I do). they aren't Swedish clogs, but I love them! yours are lovely, I'm sure, even with the sad looking wound (they just can't help themselves sometimes). Thanks for sharing the way you do ... love your blog! I adore the dress and the leggings! and the clog, of course. How strange, my word verification is "SOMMAR" !!!!!! summer? i remember the more plasticy clogs that were open toe!! (mine were red) i used to wear them to school on a wednesday when we had to go swimming and probably thought that i was the bees knees - well i did have my pink jelly bag with me too!!! I love your clog story, you write such fabulous posts and it reminded me of my own childhood when we would get 'special canvas shoes' for the holidays. Your new ones are delicious, and you look marvellous in them! i have a word of advice for you..
wear clogs whilst climbing a ladder..
for me not the clogs..
Hej Tif, I just love your red clogs and you better check this! i will be back a little later, till then, adieu! Your clogs are just lovely and they look smashing with that wonderful and quite creative outfit you have on. Love it! I love your red clogs soooooo much. Red shoes, YES! What a great story -- I laughed, I cried (kids can be so mean), I imagined putting my eyebrows down and saying "Olive, NO!" in my deepest, mean-mommy voice (my kids AND my dog know that one). 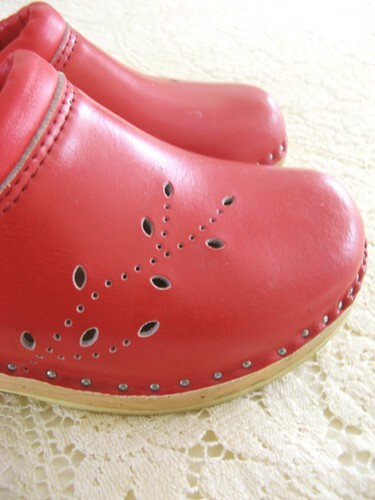 And then I went to Etsy and found my own vintage red clogs. Clogs?! I don't remember clogs. Were we on the same trip? Flip flops, now flip flops I remember. Rubber and plastic that rubbed your big toe raw. Fisherman smocks - yes of course. Sunburn - wasn't a holiday without it. Ah, happy days! Oh dear - greatest envy is here and living in my heart - clogs, leggings and that darling bag - dear oh dear oh dear. And I was also the laughed at kid but due to impecuniousness, would have HAD to continue to wear them - in the end the last laugh will be on the laughees! Is this anything like your red and blue smock top? You are officially the most stylish lady on the planet! Hi, tell me, did you make those leggings? Love them. i love the bag !!!! I waited and waited for Swedish RED CLOGS to come to me too! They finally did. Ebay, one pair my size $10. Happy Day. I am aware of my comment to be more than one year late but let me say: these clogs are perfection! Hello! Please visit my link! 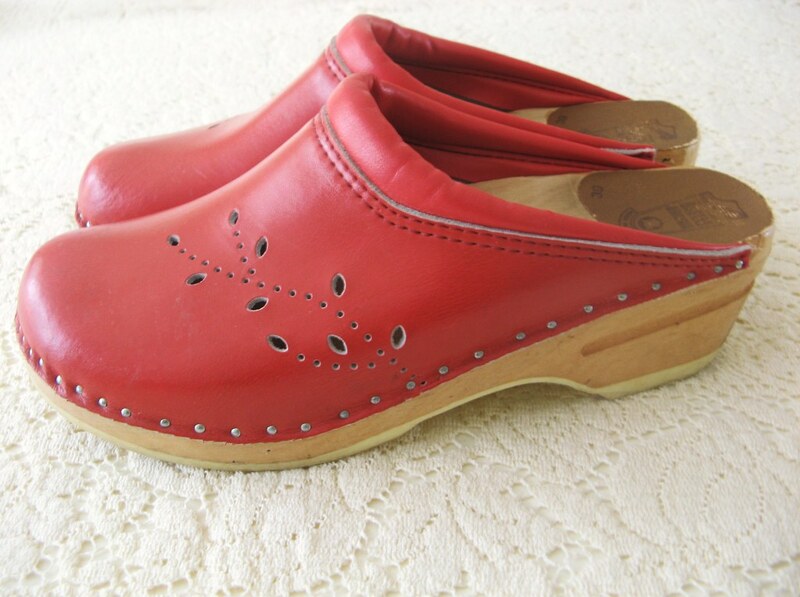 I am so excited to show you, that I, too, have this same exact wonderfully red pair of clogs!